Over maybe the last five years I have gotten really snug with using micro-cranks for crappies. In this time I have amassed a nice Plano tray of small cranks, many of which have already fooled some grand-daddy crappies and today my mail showed me three more packages of un-painted bodies, with these two in the picture measuring out at 7/10" and one inch. The quarter puts their sizes in perspective. Cute little suckers as they sit and I am sure they'll offer some challenge for me and the airbrush. I love the size. I'll be spending tomorrow drilling small holes in the belly areas and adding some lead shot so that these baits sink sort of slow, but not real slow. Once the right amount of shot has been determined and added the holes will get a quick smear of epoxy to seal up things and if needed maybe a scuff with sandpaper to smooth things back again. They'll get fished as a neutrally buoyant bait on light mono line. Certainly not the smallest in the tackle tray, but they are the smallest I have yet to paint. Right now I have four bags of un-finished bodies to paint up so I have plenty of masking to do as well as the other work mentioned. Then the fun begins. I have found it can be difficult to get them "balanced" correctly so that they wiggle on the retrieve. I got some small bait’s too and I’m interested to see how they work. Don't tie the bait directly to the line. Use a clip. On a small crank bait the line will keep it from moving side to side. On baits this small I use a clip. No split ring at the line tie, just the clip. Actually I use the Qwik-clips so I can just give a quick twist and one is off ant the other goes right on. Gary, you notice that there is only a single hook eye on these and its located further back. I'll add couple of #5 shot lead shot to the larger bait and a single #5 shot to the smaller in the same chambers as where the shot is that came in them. Basically I am looking to achieve a drop very close to neutral buoyancy only on the negative side of that by a hair and my retrieve is most always a simple start-4 or 5 cranks and-stop, 5 count and repeat. The stop is the killer. The drag on the back from the hook will give a nice wiggle this way when a clip instead of direct tying is used. Also Gary. Lots of people get frustrated with the smaller baits because they think the can crank them at speeds that make much larger cranks work flawlessly. When fishing these a person has to SLOW down the retrieve rate a lot. Light line is imperative to good action on these little guys.....3 or4 pound max and no fluoro or braid. On the line tie end of things. Lamar and I agree on the clip right to the bait's eye. These are very, very light in weight and their length becomes a critical factor too. On baits the next size I but I clip to that as well like a split ring, yet on these really small baits a clip is lighter in weight than a split ring. Casting these with the line tied directly to the eye can cause the know to move either side to side or up and down on the eye.....all of which will mess with action. The tiny clip will let the bait do what it was designed to do as long as the retrieve is kept in check. I mentioned line earlier in this thread. I use Trilene XL exclusively in 4 pound on most of my crappie rods. I use Nanofil #3 pound on two that I take when dock fishing and things are basically vertical fishing. One has to be aware of the stiffness of even light lines as too stiff a line can mess with action at the lure. Lines that sink can screw with the action of the lure. 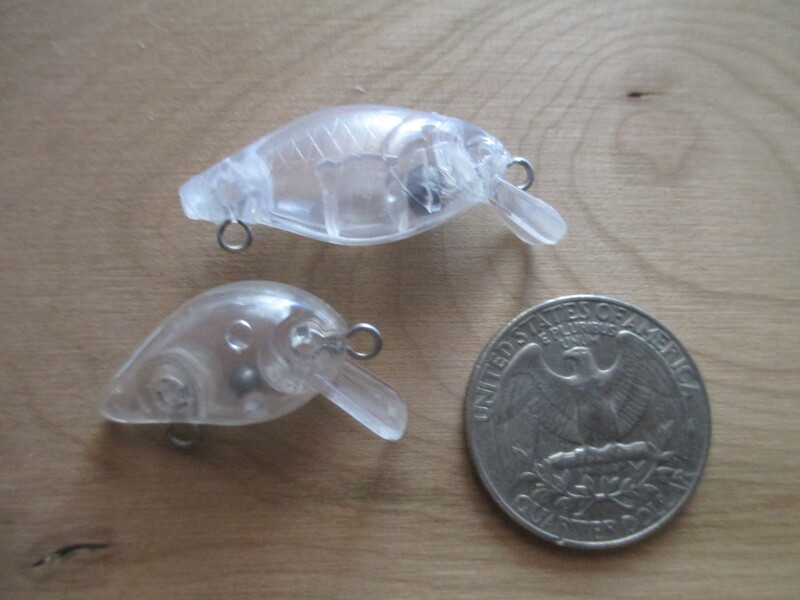 When one steps down to the size of these little critters its a whole new game and what one uses for everyday crappie tackle is most likely too stiff, too heavy, or retrieved too fast. Its not just one thing....its a combination of things that have to be considered and trust me, one little thing cn upset the applecart in a hurry. I like the challenge of fishing these super light weight lures, but honestly it may not be everyones bag of oats. Here are some that are ready for hooks. These are something else to paint. As I mentioned, challenging. But fun stuff to work with. Love the colors on these. 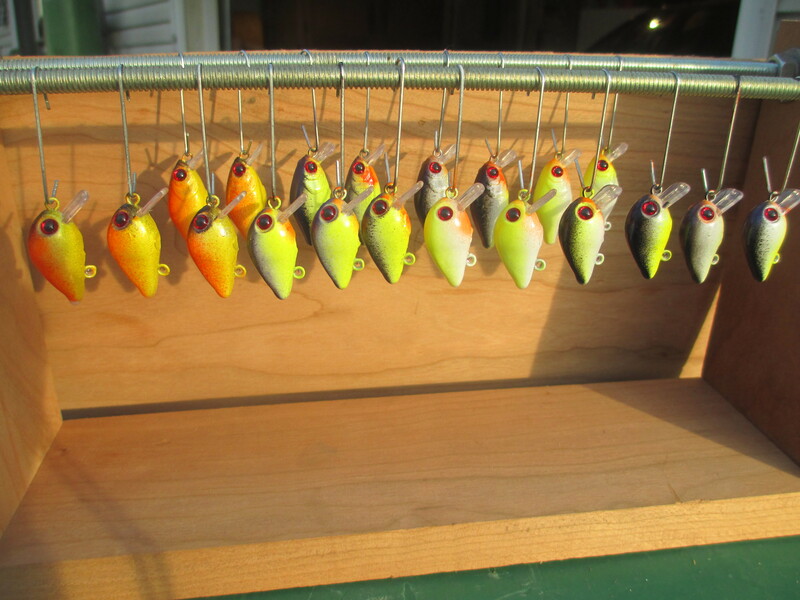 The color schemes are ones I have had luck with on other, small, commercially painted baits. I have other patterns in mind but the baits are so small that I am not sure if patterns will work well....have to see. Anyway, these are on the drying rack where they stay for three or four days to allow the seal coat to harden real well. Those look great! What size and type of hook will you use on them? Tom nice work. How about this or is it to big. Mike, I have a bag of those already. Next on the list.